The combination of nutrients eaten in a meal is as important as the number of calories in the meal. 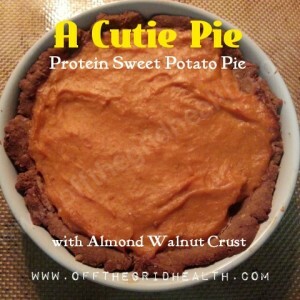 Our “Cutie pie: Protein Sweet Potato Pie is an example of tasty treat that is also well-balanced. Sweet Potato without the extra sugar and butter is an excellent weight loss food. In addition to being rich in vitamins and minerals, it contains fiber and resistant starch that stabilizes blood sugar and doesn’t add to your waistline. Sweet Potatoes are a favorite among bodybuilders and fitness models for this reason. Our Cutie Pie: Sweet Potato Pie recipe takes the nutrition up another level by adding protein to the crust and the filling. This recipe is also gluten-free when you use gluten-free oats. The crust will be crunchier and less flaky and the filling will be denser and fluffier than the texture of traditional sweet potato pie. The result is a protein packed version of a time-honored classic. 2 Tbsp. Raw organic walnuts, pecans or Brazil nuts. † I used ¼ C. unflavored pea protein + 1 tsp. of vanilla extract. 1 Tbsp. Oat flour, or nut flour Optional. Add crust ingredients to food processor. Blend to a thick crunchy peanut butter-like texture. Take half the mixture cover bottom and the sides of a mini pie pan. Use the remaining mixture to do the same a second mini pie pan. Place pans in oven and cook for 12-15 min. Add filling ingredients in a clean bowl. Mix until smooth. To avoid strings from sweet potato, mix using a (hand) blender or food processor. Add equal portions of pie filling to each if the baked crusts. Fill to top. Bake pies for 30 min at 325° F or until a knife in the center comes out clean. Remember: There are no eggs in this recipe so doneness is more a matter of texture or taste than food safety. 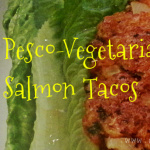 The whey makes this is a lacto-vegetarian recipe. If you want to make it vegan recipe, try vanilla or unflavored pea or brown rice protein instead but you may need to add more liquid. Using whey protein isolate instead of whey protein concentrate. Whey isolate has very little if any lactose (check your product label for details). Be sure to use protein powders that taste good to you in your favorite (almond) milk or water. It is hard to make a bad tasting protein powder taste better in this recipe.